Rollin-Rollin-Rollin', Keep them Doggies Rollin'; Yah! Yah! Mush! Pretty funny how instantly annoyed one can become over having an hour and a half's layover in a modern Airport, Eh? Although for anybody, and especially a Blind traveler needing Assistance to navigate LAX; GROAN! My 1hr 23min time to change Aeroplanes to thou "Puddle Jumper" is barely enough time! Which makes the thought of traveling by Wagon Train for months sound outright painful; Yah! Yah! From this book I learned about the Conestoga wagon, which naturally I'd never heard of before. As this wagon was legendous' as 'Ol Kenny Sargent would proclaim! Mostly in the East, being used in Pioneer style Aussie' Road Wagon convoys; OUI! Along the Appalachian trail Yet these wagons designed for carrying Mega tonnage upon "Smooth" roads were not ideal for the far more harsher terrain out West! Alas, during this crazed migration, primarily fueled by the California Gold Rush of 1849, for which I do know is how some Darn Blasted Pigskin team got Thar name 49ers, righto? Obviously wagon building became a hugely profitable business, with all sorts jumping into the melee, including the likes of John Deere, Studebaker and Sears & Roebuck, whom all got their start in wagon building during the mid 1800's. Yet our intrepid travelers retracing the Oregon Trail were utilizing one of the preferred wagons of the day, ARSE-Sumedly a re-creation, as the author just constantly mentions how Thar Schuttler wagon does this or that. As the Schuttler wagons retailed for $75 and were known for their durability, along with "improved" handling due to smaller front wagon wheels amongst other design improvements, most notably the wagon box having dampening capabilities. Yet as I learned from Narcissa Whitman's travels, the Oregon Trail wasn't defined at all, especially for wagons at first, with the treacherous routes being evolved by the Fur Traders of the Day, which included a brief passage about the Pacific Fur Company. Ironically, or more Karmically, upon discovering this Fur company was an offshoot of the American Fur Company, (AFC) setting up camp at Fort Astoria in 1811 along the "Mighty Columbia!" And learning who the founder of AFC was, set my mind racing... To learn that indeed, the town of Astoria that Mary Ellen's been chauffeuring Mwah by for several years now, is indeed named after John Jacob Astor. As in the original John Jacob Astor, Patriarch of the Astor Family in America, with the elder John having emigrated Circa 1783, whilst our Indy Cars Astor Cup was commissioned by William Vincent Astor, son of John Jacob Astor IV, who perished aboard the Titanic! The author, Rinker Buck intersperses portions of the trip with various Flashbacks of his late father Thomas F. Buck, Associate Publisher of Look Magazine, who'd ironically taken him and his older brother Nic, on a summer's wagon crossing to Pennsylvania when they were both young boys. Jailhouse Rock, Fort Fetterman, Sweetwater, Independence Rock, Rocky Ridge, and South Pass - Continental Divide, etc. - Idaho, etc. Planning to be to Oregon by November. After briefly stopping at Martin's Cove and checking out "The Show." Rinker gives a Nice description 'bout how Devil's Gate has been "Whitewashed" by The Mormon's and is now known instead as Martin's Cove. Rinker also spends time noting how massive the Cholera epidemic was during the peak migration years of 1849 and 1852, and in general before scientific information from Europe on the causes of Cholera finally arrived many years later. While lastly, another tasty nugget 'O information dished out by Rinker was his passage about Ezra Meeker; Hmm? Why is that Meeker name familiar to Mwah? As Ezra Meeker, at the spry age of 76, decided to retrace his earlier journey across the Oregon Trail in order to promote his desires for its protection from disappearing into the landscape. As he walked his covered wagon Mule Train all the way to Indiana, placing his granite "Meeker Markers" along the way, before wintering over in the Hoosier State. Then after being denied access upon New York's famed Fifth Avenue, he ended his eastwards journey on the lawn of some Whitehouse on 1600 Ave! Where he got the ear of "Big Teddy" (Roosevelt) to make the Oregon Trail a National Historic landmark. Ah Ha! Now I know where I know Meeker's name from; Eureka! 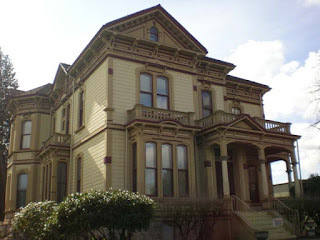 As he was the first Mayor of Puyallup, Washington, along with being a Hop Baron, building his wife Eliza Jane Sumner Meeker Mansion, et al. As Ezra made another Covered Wagon crossing in 1910 at the ripe 'Ol age of 80! Then a few more times aboard "Iron Horses" (Railroad) and lastly, remarkably at age 94 by open cockpit Biplane; Aye Karumba! Meeker's last planned trek across his beloved Oregon Trail was to be aboard his Oxmobile, a specially modified Model A with Covered wagon roof donated by Henry Ford. Yet just shy of his 98th birthday, Ezra passed away in late 1928. Rollin-Rollin-Rollin', Keep 'em Doggies Rollin!